Heaven Nightclub and and Holosuites (or known simply as Heaven) is a popular recreational facility located on Forever World in Gateway City. Heaven is a multi-level, vibrant and popular attraction in Gateway City, drawing crowds of travelers and city inhabitants with its offerings of drink, food, gaming, and fantasy fulfillment. 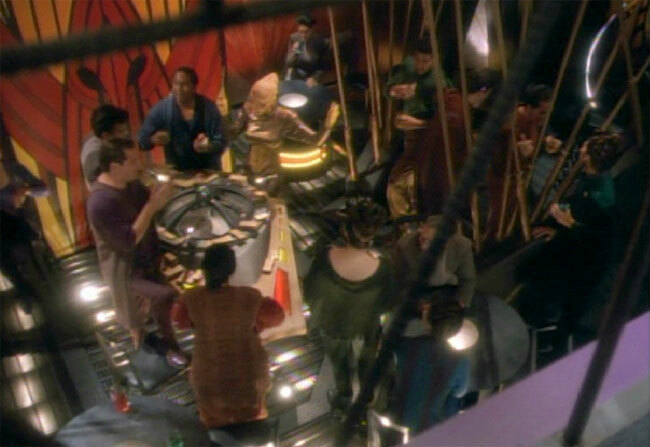 The owner and proprietor of Heaven is Evan James McNamara , a former Starfleet Officer who has since retired. Heaven is considered the most popular establishment in Gateway City. 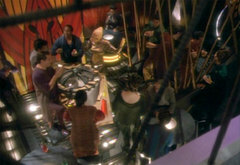 The nightclub normally features live music, dancing girls, Dabo and Poker Tables, as well as Holosuites. The club has a reputation of creating an atmosphere of sheer paradise, hence the name "Heaven". 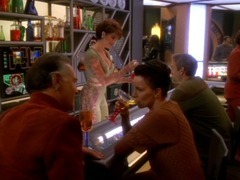 A large number of drinks and brightly colored drinking glasses are stored behind the bar, along with four replicators, a computer access terminal, and a selection of isolinear rods containing programs for use in the holosuites. A range of foods and beverages are served at Heaven. Most of the food is replicated, while the drinks are either replicated or come fresh from bottles kept behind the bar. 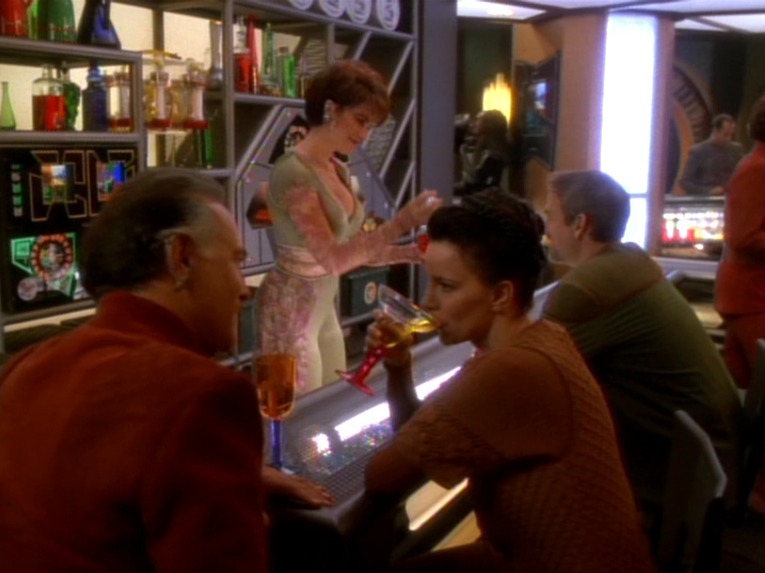 McNamara also keeps a private stock of drinks, which include Terran Scotch, I'Dannian Rum, Klingon Bloodwine, and Romulan Ale. The private stock is brought out for VIP customers. Heaven also operates as a casino. 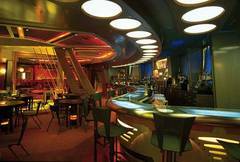 A number of gaming tables are located in the back portion of the nightclub, the most prominent of which is Dabo. There are poker tables and Tongo tables as well. Heaven also has an assortment of dom-jot tables, Prayko alleys, darts boards, and billiard tables. Heaven also houses a holosuite arcade that has a number of enticing holographic programs. 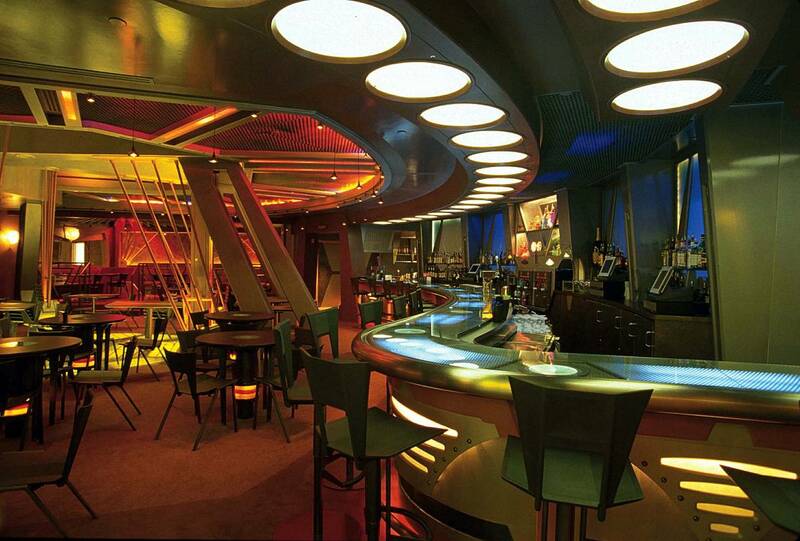 Credits for use of the holosuites are purchased at the bar. The holosuites are often used by visitors to Heaven for programs of an adult (sensual and even sexual) nature, while residents of the planet use them for more benign recreations. McNamara himself is known for using the holosuites for baseball and sailing programs. The staff of Heaven falls into five groups: waiters, bartenders, bouncers, dabo girls, and exotic dancers (the two latter groups are usually dressed up like Angels, keeping with the Heaven theme). A notable employee of Heaven is its lead bouncer, a large Gorn named Skud. Skud is usually the first person one sees at the nightclub, as he usually checks identification at the entrance. Skud is also used for “bouncing” unruly guests. If a person is ever cast out (bounced) from Heaven, they are never allowed to return. The policy is non-negotiable, although some have tried to manipulate the rule but all have failed. It is not confirmed, but Heaven is believed to have hidden passageways to undisclosed rooms. It is uncertain if these passages and rooms actually exist, but there have been accusations that McNamara deals in illegal activities outside of propriety. It is believed that McNamara uses the “secret” rooms for said illegal activities. Heaven is a neutral establishment and allows all to patronize the club. Heaven's strictest rule is that everyone remain cordial and leave all confrontations outside. If this rule is broken, said violators are cast out from Heaven, and never allowed to return.